Edmund Gerber (24-2) defends the WBC Silver Int’l heavyweight title against Jason Bergman (24-11-2) on the undercard to Ruslan Chagaev vs Francesco Pianeta July 11 at the Getec Arena in Magdeburg. Gerber lost to Dereck Chisora in 2013, left Sauerland Event and returned in 2014 and was of course rewarded with a title fight that he won and here he is. Lightheavies Shefat Isufi (17-2-2) and Dariusz Sek (22-2-1) clash for the Eurasia Pacific Boxing Council (a WBC subtitle) bauble July 4 in Munich (Germany) on a show promoted by LMS Promotion. Behind LMS is reigning GBU and WBA I/C heavyweight champ Aleksander Petkovic. 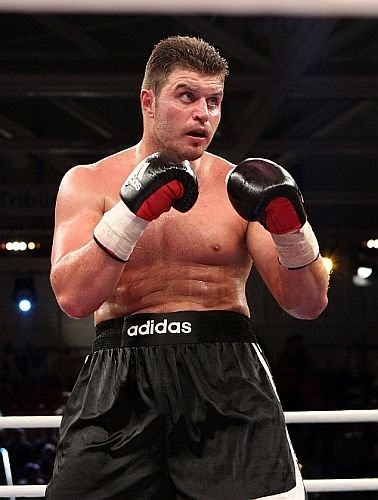 Mark De Mori (29-1-2) defends the WBU - German version - heavyweight title against Bolivian Saul Farah (55-20-3) July 4 in Martfeld (Germany). De Mori was set to defend the title last month as well but was told by some he had a chance to fight Deontay Wilder and the fight was cancelled. Mark hails from Australia but lives in Croatia and is represented in the US by Don King. Welters Jorge Fortea (13-0-1) and Kelvin Dotel (8-1) square off for the vacant Spanish title July 10 at the Casino Torrequebrada in Benalmadea. This headline a Balearic Affair and Tundra promotion. In the chief support cruiser Cesar Cordoba (8-0) take on Latvian veteran Arturs Kulikauskis (16-25-5).